The technical side of the project has taken a major step forward with the development of the first boiler cassette to perform above its required output. The engine of the steam car is a two-stage turbine, the target is to produce 360 hp. In order to achieve this power output, the turbine must be fed with steam from the boilers at a rate of 40Kg per minute. The latest boiler lay out uses 12 identical boiler cassettes. Each boiler cassette is similar in size to a large suitcase. In order to work efficiently the boiler has to transfer as much of the heat from the burner into the water as possible. Heat that is not transferred into the water is lost through the burner exhaust. In order to keep the size of the car to a minimum the boilers also need to be as compact as possible, so the heat transfer must take place in a small volume. 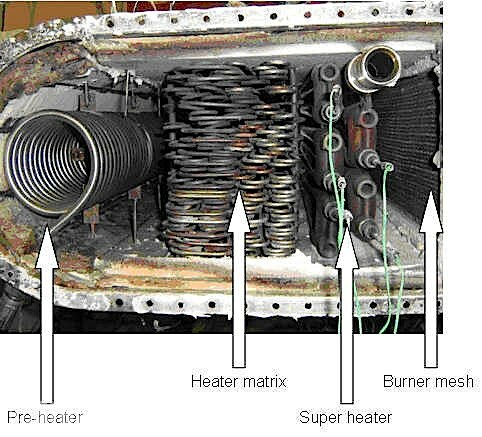 The latest tests recorded a burner temperature of 1100 °C and an exhaust temperature of under 300°C. This demonstrates a substantial heat transfer in a small package. The water enters the boiler through the pre heater, this is the first heating stage. The water then passes through the small pipes of the heater matrix where the conversion into steam takes place. Before exiting the boiler the steam passes through the super heater where it is conditioned into good quality dry steam. This design will use over 3.0 Km of boiler tubing. 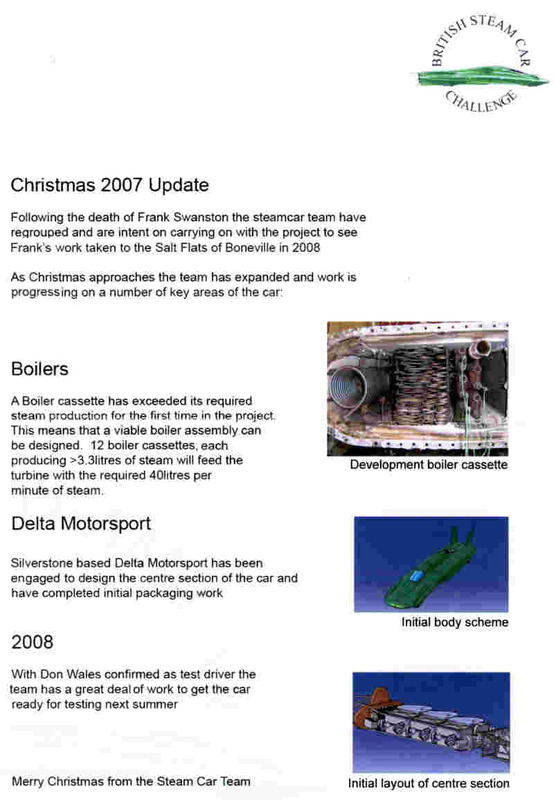 Now the team have a boiler concept that is capable of producing sufficient steam, work can begin on a layout for the central section of the car.